• The HP 1820 Switch Series features an intuitive Web management interface with an enhanced navigation pane for easy management of devices by non-technical users. 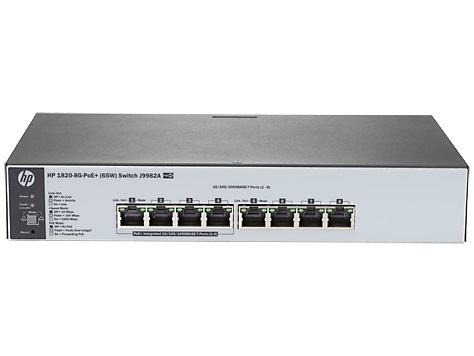 The HP 1820 Switch Series is ideal for organizations that require simplicity. • Customizable features include VLANs, Spanning Tree, Link aggregation trunking, and IGMP Snooping. All models include Rapid Spanning Tree Protocol (RSTP) and DSCP QoS policies. • The HP 1820 Switch Series include the latest energy-savings capabilities, including Energy Efficient Ethernet (IEEE), idle-port power down and PoE Port Scheduler. • All switches are covered by a Limited Lifetime Warranty 2.0 with limited 24x7 telephone support for the first three years. • The HP 1820 Switch Series traffic prioritization provides time sensitive packets (like VoIP and video) with priority over other traffic based on DSCP or IEEE 802.1p classification. Packets are mapped to eight hardware queues for more effective throughput.